Ansari And Yang Explore The First-Generation Experience In 'Master Of None' Parks and Recreation colleagues Aziz Ansari and Alan Yang bonded over their experiences as Asian-Americans living very different lives from their parents. Their new series is streaming on Netflix. Aziz Ansari plays Dev, an Indian-American actor in search of fulfilling roles, in Netflix's Master of None. In the new Netflix series Master of None, comic Aziz Ansari plays an Indian-American actor in New York who's having a hard time finding good roles. It's a story that Ansari and other actors are familiar with. 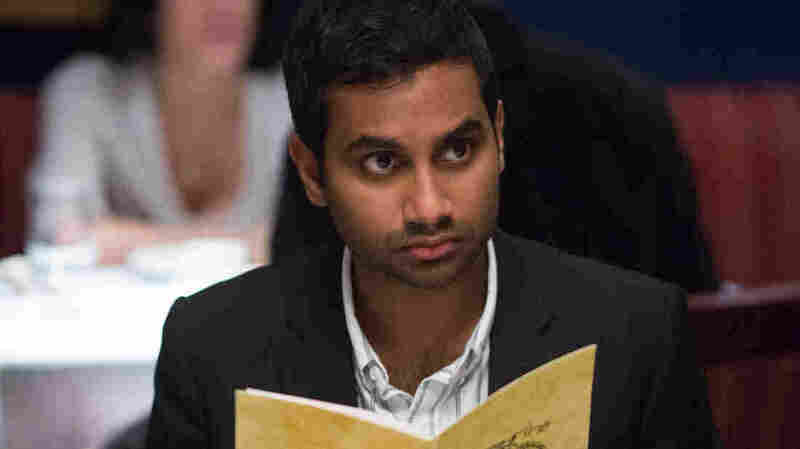 "As an actor there [are] frustrations when you don't create your own content," Ansari tells Fresh Air's Terry Gross. "I feel like if I didn't do this show, the kind of stuff I would've been offered, if it wasn't just ethnic stuff, it would've been just versions of things I've done in the past ... where I would just come into a room and yell things that sounded vaguely like 'treat yo self.' "
Ansari is known for his stand-up as well as for his roles in the film Funny People and on the TV series Parks and Recreation (from which the tagline "treat yo self" came). He describes Master of None, which he co-created and co-writes with Alan Yang, as a show that has a nuanced approach to ethnicity and race. Yang, like Ansari, is a first-generation Asian-American whose parents faced hardship both before and after they moved to the United States. He recalls telling Ansari a story about how his father, who was raised by a single mother in Taiwan, once had to kill and eat his pet chicken when he was a child to keep from going hungry. "I was talking to Aziz and said, 'And now his son gets to sit in a hotel room with a famous comedian and work on a TV show with him,' " Yang tells Gross. "And Aziz had similar stories about the sacrifices his family had made. ... It's just something you kind of take for granted sometimes as the children of immigrants." Aziz Ansari: We also wanted to depict this character that's not just a man-child, per se, which is a character you see a lot in these kinds of comedies and in film as well. The guy is not Seth Rogen in Knocked Up. He has his life together to a certain point, and he's pretty mature for the most part. To us, we wanted to explore what happens to a guy that does have his life together and is a little bit mature, who is still struggling with his life decisions. Alan Yang: For me personally, as people who know me know, I'm the most positive, upbeat sort of happy person. And a lot of people think that's sort of incongruous with comedy, because there's a long tradition of complaint and misanthropy and being negative in comedy, and that's great, that stuff is all really funny. [But] we try to, I think, thread a needle of being a little bit more positive and a little bit more understanding. Yang: There is a psychic gulf that exists between myself and my grandparents because they don't really speak English and I don't speak Chinese and that's my own personal shame, because I did not learn ever. I only saw my paternal grandma a few times in my life, and that's really crazy. All these white people visit their grandparents all the time, and I think there's a bit in the show about Aziz talking to his grandparents — it's the same thing with mine. If I'm talking on the phone with my grandma, she doesn't speak English and I don't speak Chinese, so I'm not sure what we're supposed to say. Ansari: There's this kind of strange conversation of obligation that you have that is really a gesture that doesn't mean anything. I do it in the episode — there's an episode called "Old People" that's about ... respecting the elderly and getting to know old people a little bit and not just ignoring them. In that scene I tell my girlfriend about how when I talk to my grandma, we just have the same conversation where I go like, "Hello! How are you? OK. I'm gonna put my dad on now." Ansari: She came to South Carolina. My dad picked her up from the airport, took her home and then my dad had to go to the hospital and work. And so she's sitting in this apartment in South Carolina; she doesn't know anyone; she's all alone. She had an arranged marriage, so she had known my dad for about a week ... and she's just there in this apartment. I asked her, "What did you do that first day, did you watch TV? Did you read a book?" And I put it in the episode because it hit me so hard: She said, "No, I just sat on the couch and cried." You hear that and you're like, "Wow, these people really did something pretty incredible to get here and give me this spectacular life that I've been able to have and I've never really thought about it." I've never thought about them coming to South Carolina and trying to build a life in this strange place where they didn't know anybody and dealing with racism — and like, much harder racism than, "Oh, I gotta do an accent in the audition!" Like real stuff where people are pretty mean. So it was a great conversation to have, and I think a lot of immigrant kids probably don't have that conversation with their parents. 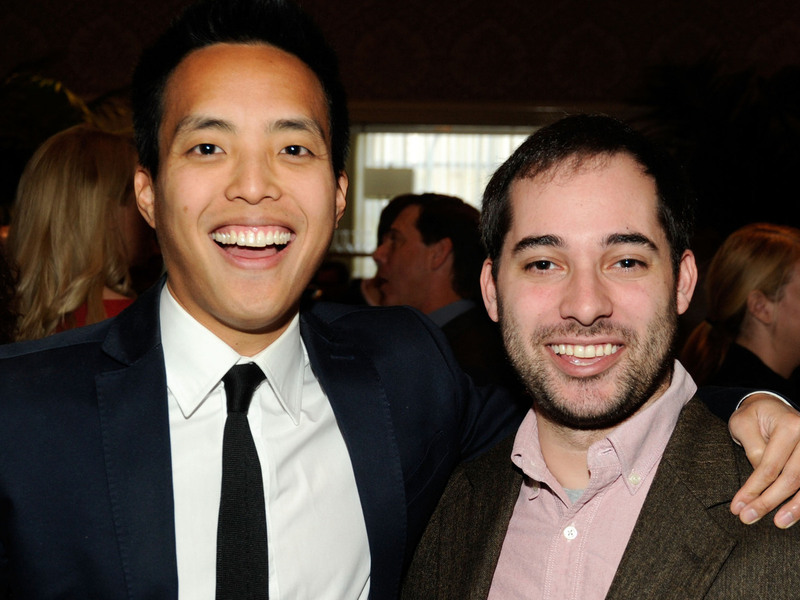 Alan Yang poses fellow writer Harris Wittels at the 2012 AFI Awards. Wittels died on Feb. 19, 2015. I'm happy that I got to spend as much time with him as I did before he left. And you see — there [are] moments in the show that are such Harris moments that I'm so glad are in there. And it's so sad that he's not able to see what we ended up doing with some of the great stuff he did.